Being regularly physically active and eating a nutritious diet is a vitally important prophylactic against chronic disease. These two critical lifestyle choices are the most important strategies that we can all adopt to protect ourselves from the biggest killers in the developed world today – none communicable lifestyle diseases or NCLD’s. Cardiovascular disease, cancer and stroke are the big three and they constitute the vast majority of non-accidental premature deaths in the Western world. The number of people perishing to these diseases is astronomical. In the UK alone these three degenerative maladies account for around 150,000 deaths every year; over one million every seven years. Despite major advances in medical approaches to treating these conditions the incidence of cases is continuing to increase across the developed world. It is now emerging that a key contributor to these disorders may be an interruption to blood sugar balance driven by a condition known as insulin resistance (IR). If left to progress, IR is very likely to develop into full blown type 2 diabetes (T2D). At this point tissue damage escalates dramatically. T2D is now a global pandemic and in the UK alone there are 3 million people diagnosed with diabetes and an estimated 850,000 people who have the condition but don’t know it. Insulin resistance is very closely linked to accumulation of excess bodyfat, particularly central obesity or visceral fat (fat around the organs). Emerging evidence is also indicating that being sedentary and having a poor diet may also bring about IR in the absence of dramatic weight gain. It is interesting to note that when migrants travel from a country with traditionally very low rates of T2D (China) to countries with high levels (USA) the travelers adopt the same (or higher) levels of T2D to the host country. This points to the dietary and lifestyle aspect of the disease as well as a genetic susceptibility for certain ethnicities. Type two diabetes is particularly insidious as it can lay undetected or many years. Throughout this concealed period elevated blood sugar levels reach toxic proportions damaging tissues and organs, particular kidneys, blood vessels, eyes and nervous system. Most type 2 diabetics have at least one of the above complications at the point of diagnosis. The majority of type 2 diabetics will not reach their 60th birthday and coronary heart disease (damage to the arteries supplying the heart muscle) is responsible for the vast majority of these tragic premature deaths. Mankind has evolved around a very active life. Hunting, gathering, building shelter and foraging or scavenging for foods. There would also have been forays with savage and dangerous wild animals or other predators setting the heart racing and requiring every sinew in the body to respond to this supreme threat. These are highly energy intensive activities requiring cardio-vascular fitness and muscular strength and endurance. They are the basic components of fitness for us all. Against this background we have evolved for thousands in fact millions of years. Our metabolic and life systems such as blood sugar control, energy management, blood pressure, digestive function, mental health, stress function and social conditioning have developed in an environment requiring constant physical activity. Today however, our lives are very different. It is not uncommon for someone to get up in a morning, bumble around the house, shower and jump in the car for work. Once there they are likely to sit at their desk most of the day, occasionally getting up for a cup of tea or to visit the loo. Lunch eaten at the desk is symptomatic of a hectic and stressful day, leaving the individual feeling tired and exhausted at 5.30. So into the car and off home to put the feet up and have glass of wine or beer to anesthetise themselves against the pressures of life. In terms of calories burned as discretionary physical activity, this familiar pattern for many people constitutes less than 50kcal/day (it takes a 30 minute brisk walk to burn 120kcal for the average person). This is the epitome of a sedentary life and it is reality for very many people. It is little wonder then that following years of this lifestyle the body simply starts to fail. For those at risk of diabetes either due to family history or from blood sugar levels diagnosed as pre-diabetic or glucose intolerant, certain dietary precautions should be adopted. Primarily the main focus should be on calorie reduced diet in order to reduce chronic calorie overload which is now widely suspected as a leading cause of T2D. Reducing waistline in particular is a key protection in the prevention of T2D. It is well established that waist measurement correlates very highly with intra-abdominal fat which is itself a sign that fat is accumulating in the organs. The accumulation of fat in the organs increases the risk of T2D exponentially. A diet that is high in simple sugars and refined carbohydrates (high glycaemic index – GI) will be particularly harmful for the ‘at risk’ individual. This is due to the very high blood sugar levels that such a diet will elicit. Subsequently the pancreas will have to produce very high levels of insulin to remove this sugar. One of the progressive aspects of the disease of T2D is that as time goes by the pancreas starts to fail. The more stress that is placed upon the pancreas the more swiftly it will deteriorate. Furthermore as sugar levels rise in the body defects may also include toxic effects of glucose on the beta cells that produce insulin, accelerating the decline of this glandular organ. Finally, a high consumption of sugar and High GI carbohydrate may actually facilitate an increase in body fat through an increased conversion of sugars to fat in the liver and subsequent storage as fat increasing the stress on the organs. Eating a fatty diet may work to increase risk of T2D on two levels, firstly making weight control difficult and increasing total fat mass (which increases IR) and secondly negatively impacting lipid profile (fats in the blood) resulting in high levels of circulating triglycerides and harmful cholesterol. Excess fats in the blood interfere with the action of insulin on target cells such as muscle and liver cells. There is also a build-up of fat in the pancreas leading to a toxic effect on the insulin producing β-cells) which is a suspected route to pancreatic failure. Therefor too much fat in the diet interferes with both insulin sensitivity and insulin production. A balanced nutritious low GI low fat diet will offer optimum health protective benefits against T2D. A healthy diet combined with an active life will support weight control, normalise blood pressure, improve lipid profile and mental health and wellbeing. Furthermore regular exercise will have the effect of reducing insulin requirements through an increased uptake of glucose during exercise and increased tissue sensitivity following exercise. 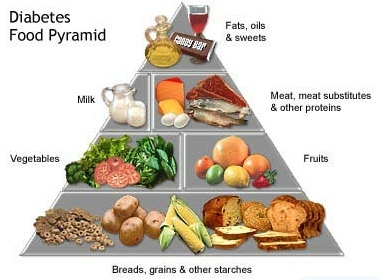 A healthy diet will also provide the appropriate nutrients and macronutrient balance to enable adequate immune function and the ability for the body to repair and repel invading pathogens (infections can be more threatening to people with diabetes), as well as protecting the vascular system which is also at particular risk. Ensuring at least 5 portions of fruit and vegetables each day will offer a high antioxidant status that protects against the degenerative components of diabetes that can lead to the complications of vascular disease and amputations. We all know that we ought to do the right thing in terms of healthy lifestyle choices (and this is all that the 6 point plan is). However sometimes we just need a nudge in the right direction to do so. I hope this helps to prevent a few cases of this terrible disease. Alan Jackson is the Founder of Weight Management Centre in London, UK and author of the Discovery Learning. If you would like to write for HealthResource4u, check our guest submission guidelines.